My turn… finally! We had about 20-25 people in the room today for my talk. Just a good number of people for the size of the room. 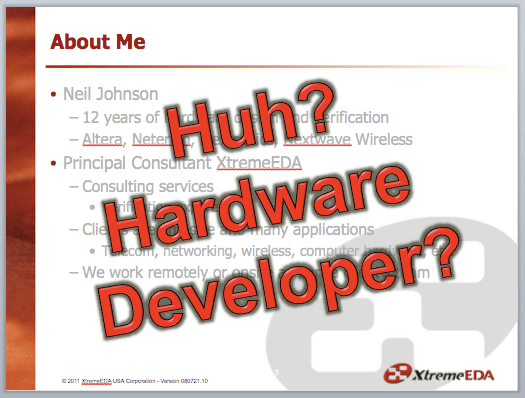 As you can tell by the third slide in my presentation, I feel I’m definitely playing the role of outsider here at Agile2011. But that passed as soon as people starting asking questions. I got some very good questions regarding where agile is most applicable and how we can get software developers more involved. The discussions afterward were very encouraging. Thanks to everyone that attended. I felt uncertain walking in and encouraged walking out. It was a great experience and I sincerely hope there’s more embedded agile in the cards for future agile conferences. James Grenning and Nancy Van Schooenderwoert have done a great job putting the stage together. It’s come at a good time too with embedded systems becoming increasingly relevant. I decided to shake things up with the 1:30 slot and attend a talk in the business and project management track. I’ll admit that I got to this one late and some of the material went over my head, but the discussion at the table I sat at was really good (again). One ah-ha moment I had was triggered in this session when Jason Dean the presenter talked about a corporation that had a failed attempt at adopting agile after which they back to the “old way”. Seems a common theme where corporations attempt agile once, fail at it and return to the way they’ve always done things. But what happens when they fail at the “old way”? Seems organizations are much more tolerant of that kind of failure. The next very practical bit of advice came regarding development metrics. Jason pointed out that many organizations track many metrics for no reason and that doing so creates a lot of overhead and bureaucracy. He recommended people ask themselves why they are tracking certain things. Are they being used? By who? And when? Just asking the questions can potentially cut out a lot of what isn’t helping and bring focus to was is helping. This was a good talk from Timo Punkka from Finland. This was interesting for me because I reviewed Timo’s slides a couple weeks ago so we could make sure we weren’t overlapping material (considering we were on the same stage). This was a case where the slides on their own a couple of weeks ago didn’t carry the entire message; having Timo talk through them was huge. He explained situations where he and his team built embedded software and boards using agile. Yes, actual boards! The most striking example was a 10 week project where the team built 3 prototypes during that time so they could fine tune the design of the board and corresponding software. In another project, he described how they built an enclosure that relied on a model of the end board. With that they were able to test things like cabling and if I remember right, the model of the board uncovered a bug in the mechanical design. Great final session of the day. Neil, you did a great job. Also you work and mission were confirmed by an attendee who’s had his development organization using agile approaches to HW, SW, ASIC development and tells how it has saved thier organization. Paraphrasing: “We’ve been doing this for three years. I could not stop the people from using agile if I wanted to.” Keep up the good and important work!